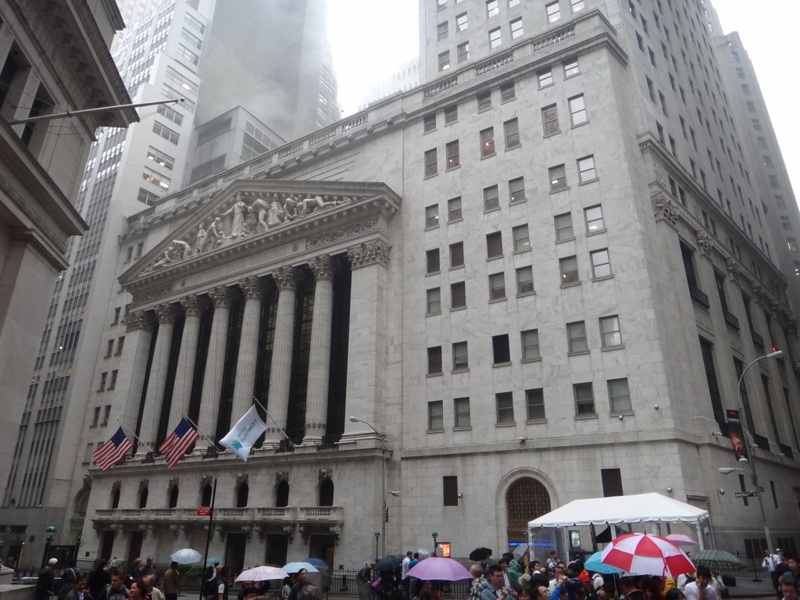 Photograph 1 - The famous or infamous NYSE (New York Stock Exchange) on Wall Street NYC. Photograph 2 - South Tower Footprint, World Trade Centre Memorial Site NYC (not Ground Zero anymore). 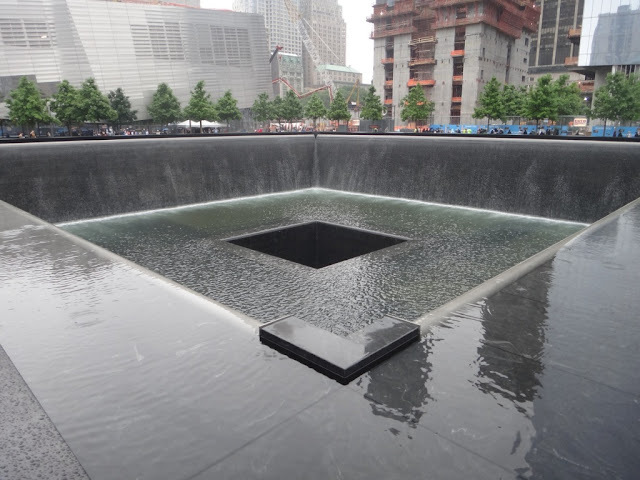 Photograph 3 - North Tower Footprint, World Trade Centre Memorial, NYC. Photograph 4 - Dakota Appartment entrance, next to Grand Central Park. This is the site where John Lennon was murdered. Photograph 5 - The tall but not the tallest Rockafellow Building NYC. The first TV broadcast was televised here. 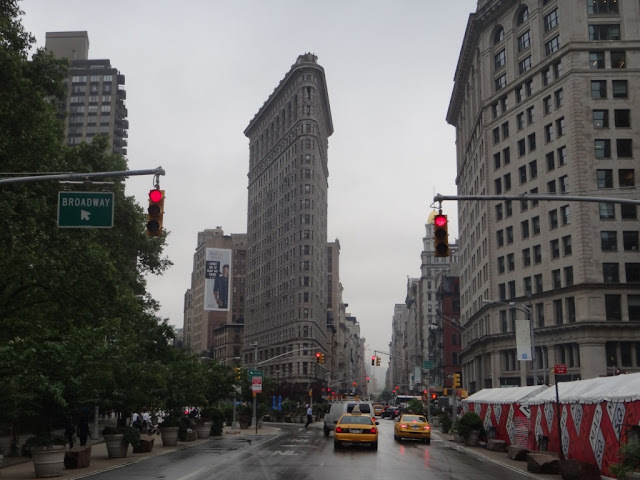 Photograph 6 - The famous Flatiron Building NYC. The city's first skyscraper back in c1902. 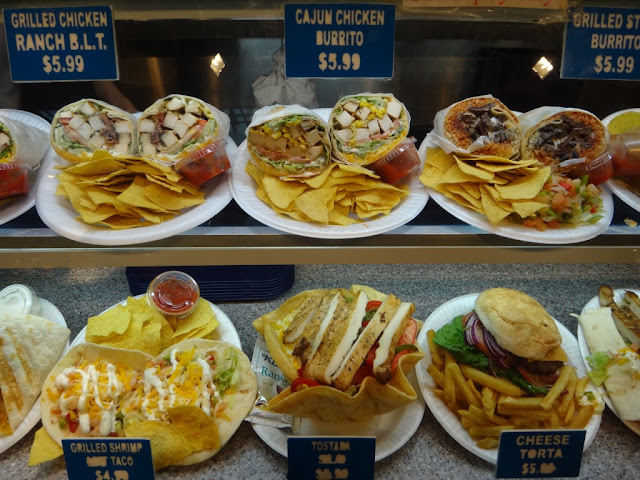 Photograph 7 - Yummy food at the South Street Pier food court Financial District NTC. 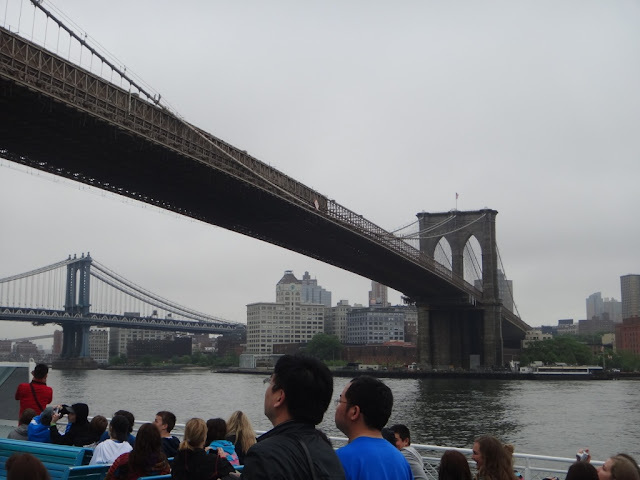 Photograp 8 - Brooklyn Bridge from our boat cruise NYC. Photograph 9 - The Manhattan Skyline from boat cruise looking towards where the two World Trade Centre buidlings were. Photograph 10 - Guess who?? With the famous lady. Photograph 11 - The Manhattan Skyline taken from our boat cruise looking towards Battery Point.-------------------------------------------------------------------------------------------------------------------------------------------------------------------------------------------------------------------------------------------------------------------------------------------------This a belated narrative because our accommodation does have a WiFi but its ability to allow me to access the internet was woeful. I only had about ten minutes of exposure time then a wait of several hours before I had another ten minutes to access the systen. Now I'm writing this two days later from the Amtrak journey from NYC to Boston. What I remember was - The weather was terrible. It drizzled in the early hours followed by torrential rain through most of the day - we got wet!!! We took a chance and made it to the Manhattan Heliport on Pier 6 to see if our helicopter ride over Manhattan was feasible - not a chance - it was sooooo foggy and couldn't see the tops of most buildings including the short ones. We did arrange to postpone the ride for two days (Saturday) time. What did we do next - we walked along the financial district and saw the New York Stock Exchange (NYSE) on Wall Street and where George Washington was inaugurated (remember when he became the first President New York City was the capitol). From Wall Street (yes the infamous Wall Street) we walked to the site of the World Trade Centre. 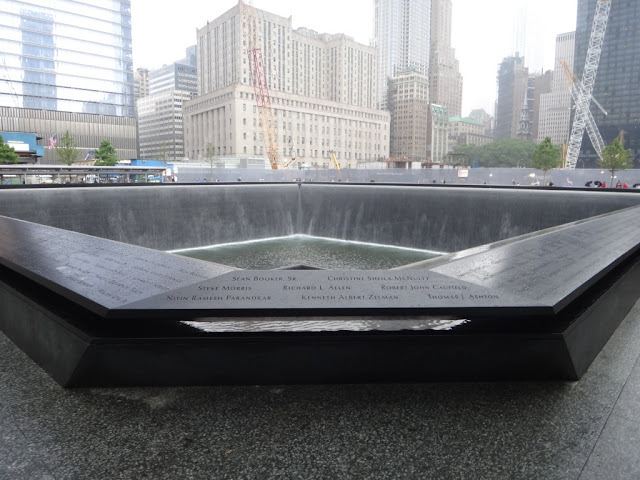 It is now called 9/11 Memorial Site (not Ground Zero) The Memeorial site is completely enclosed and visitors must obtain tickets from the temporary museum a few blocks away. These tickets are free. This is what we did and after going through a heavy security check (remove belts and all things metallic) we entered the site. What they have done is made two holes where the two buildings were and created a 30 foot waterfall pouring over each hole on all sides. In the centre of each footprint is another 30 foot hole to let the water go underground. Along the sides are all the names of victims. As one can imagine each "building" footprint is huge. It was so emotional one cannot stop and think how terrifying it was on the day. There is now a building where WTC 7 once stood and a new building has emerged. It will be 1776 feet tall - remember the date of the American Revolution? 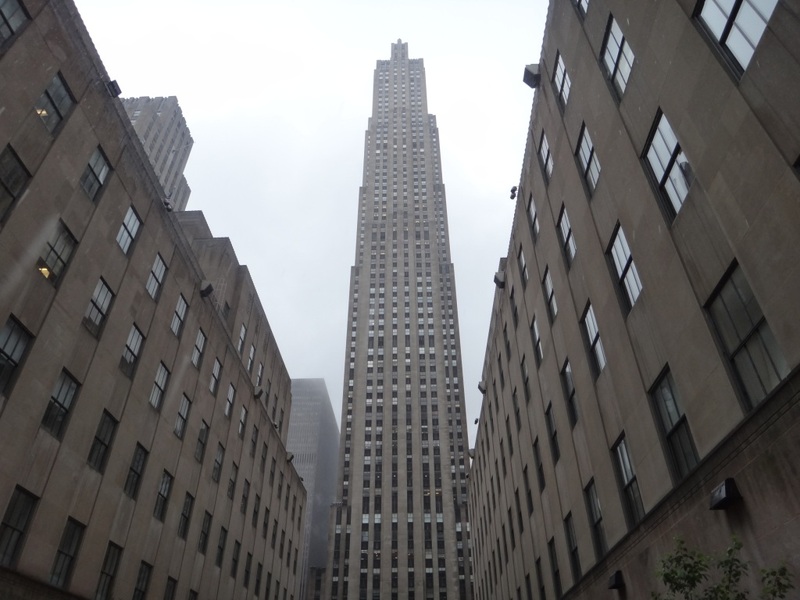 This building has now reached the highest building in NYC and surpasses the Empire State Building. We found out that there were ten buildings that collapsed on 9/11. We were deep in thought when the rain fell - sorry the sky opened up and we were drenched - even with our raincoats on. After a short period when the rain did abate we managed to catch the subway back to our accommodation for a change of clothes. From our accommodation we quickly grabbed a cab to 50th Street to commence our 5.5 hour city tour. We made it by 5 minutes. Our tour guide whose name is "Bronx" Jim is an actor, ventriloquist and basically a funny person. He kept us laughing the entire tour. He bags out New Jersey and loves NYC - he was born and bred here. 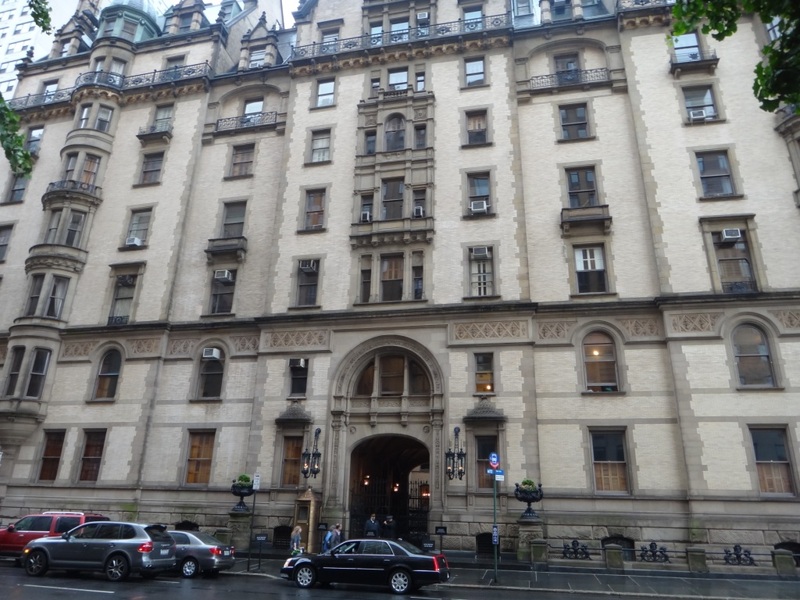 We visited 5th Avenue, Rockefeller Building, Flatiron Buidling, Grand Central Park and amazingly the Dakota Apartments where John Lennon was murdered. The weather by this time had abated but did not give us much trouble. 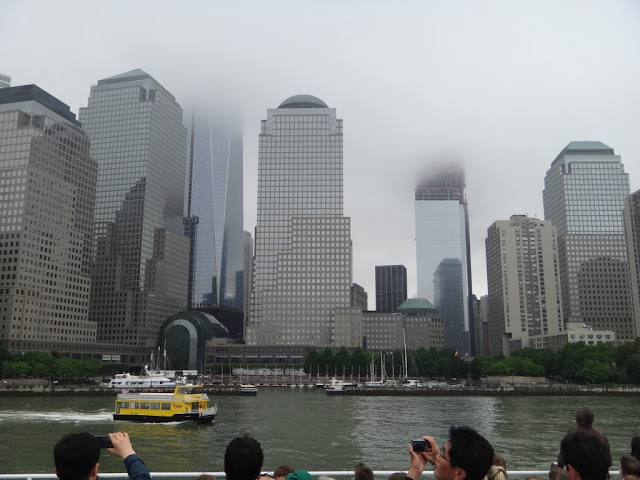 After going through midtown we bused it to Pier 23 to board a tour boat. 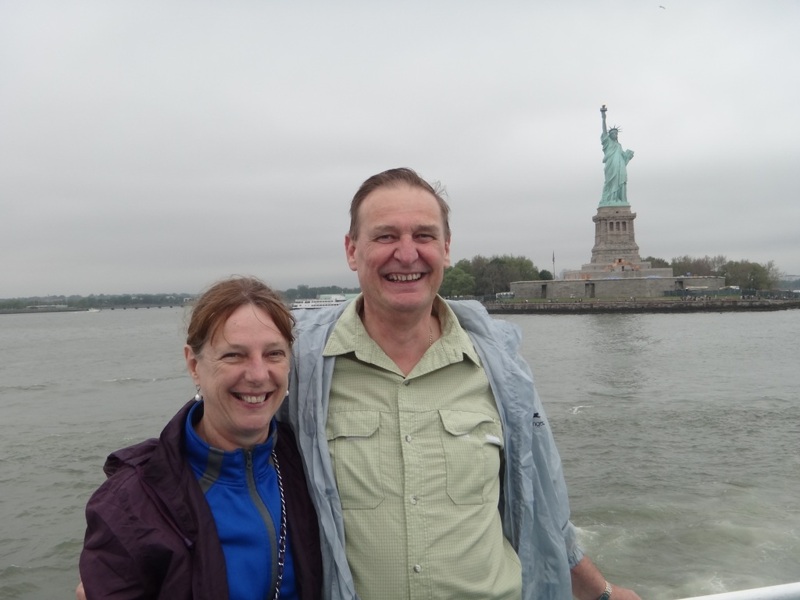 This was the highlight of the tour - we sailed under the Brooklyn Bridge, circled around The Statue Of Liberty, passed the WTC site from the Hudson River. 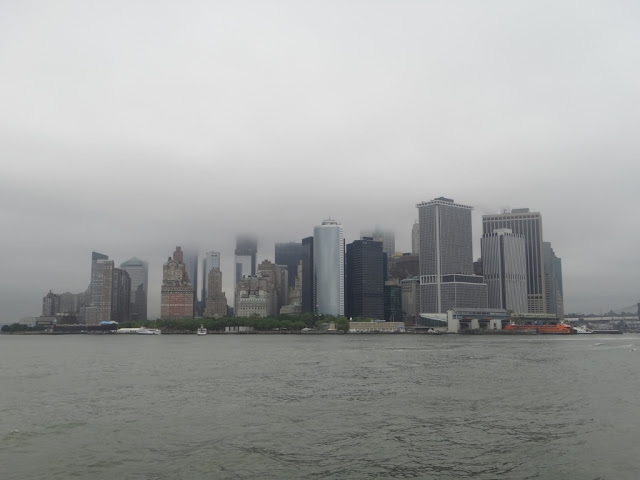 The weather gave has some clarity of the Manhattan skyline however the grey skies made some fabulous pictures. When we disembarked from the boat we continued on into Wall Street. Remember we were there this morning, this time our guide gave us some historical and interesting stories including a terrorist attack back in 1920. Apparently there was a bomb planted from a horse carriage that tried to destoy the Trump Building and many people - we felt sorry for the horse! The legacy of this building are deep holes on the outside of the building - amazing. From Wall and Broad Streets we ventured to the WTC site. This time we tried to see this from the outside. Basically nothing can be seen and we were glad we saw this earlier on. After the tour we were deposited back at 50th Street and caught the subway back to West Village (Christopher Steet Station on the A Line) We now believe we were experts in the art of using NYC's subways and navigating down the myriads of confusing streets. We had dinner at a West Village restuarant and Anne had a lucky escape in eating some soup. As some know she cannot have onions and after being explicitly told there were none in the soup she ordered she found plenty. Needless to say the busboy did not receive any tips. That's all I can remember and cheers to all.